Pasta is a generic term for Italian variants of noodles. There are nearly 350 different types and shapes of pasta. Pasta is made from a dough of flour, water and/or eggs. It is used in dishes where pasta products are the primary ingredient, served with sauce and seasonings. It is categorized into two basic styles: dried and fresh. Dried pasta is prepared without eggs and can be stored for two years under normal conditions, whereas fresh pasta is prepared using eggs and can be kept for a couple of days in the refrigerator. While preparing for consumption, pasta is mostly boiled. It is generally served with any type of sauce, depending upon the consistency and ease of eating. Long form pasta or strand pasta: It appears spaghetti-like and can be twisted around the fork. It comes in varying widths, from the thinnest angel hair to the plumpest bucatini. The strand pasta can be round or flat and solid or hollow. Ribbon pasta: It is a sub-category of long form (strand) pasta and has flat cuts. Fettuccine, linguine, tagliatelle and lasagne are the well-known examples of ribbon pasta. Tubular pasta: It is a short form pasta that ranges from tiny to jumbo, smooth or ridged, straight-cut or diagonally cut. Manicotti, rigatoni, elbows and penne are some best known cuts in tubular pasta. 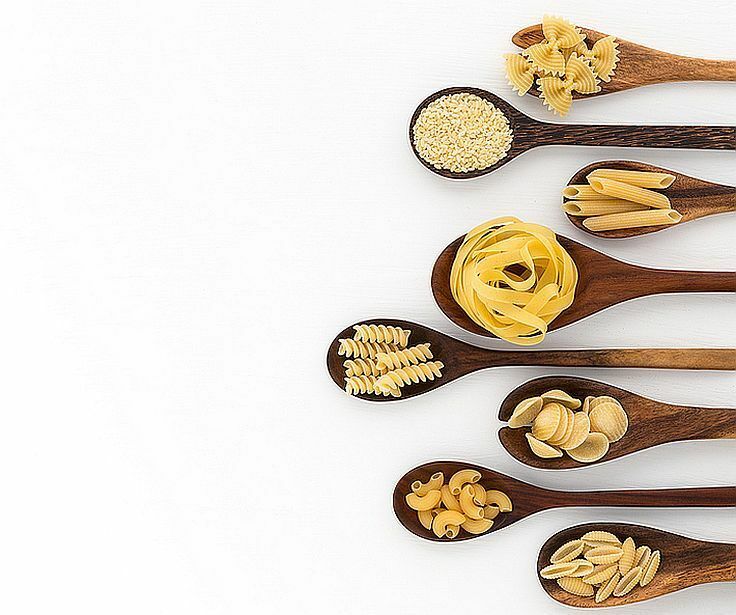 Shaped pasta: It comes in hundreds of regional varieties. There are numerous ways to twist, curl and shape the pasta. Fusilli (corkscrews), farfalle (bow ties) and ruote (wagon wheels) are some common examples of shaped pasta. Stuffed pasta: Stuffed pasta includes agnolotti, tortellini, mezzelune, ravioli, and "dumpling" pasta like gnocchi. Angel Hair, Capellini: It is thin, delicate strand of pasta which is best used with delicate sauces. It can be broken into half and used in soups, salads and stir-fry meals. Bow Ties, Farfalle: Bow ties or butterfly-shaped pasta can brighten any meal with their unique size. It is thick in texture and can be used with any sauce, salads and soups. Fettuccini: Fettuccini or small ribbon-shaped pasta is best for heavier sauces, like cheese, meat and tomato sauces. For variety, they are broken into half and used in soups and salads. Fusilli: Fusilli or twisted spaghetti is long, spiral-shaped and can be topped with any sauce. If broken in half, it can be added to soups and salads. It also bakes well in casseroles. Linguini: Linguini or little tongues is a great shape for all sauces. It can be used for salads and stir-fry dishes. Elbow Macaroni: Elbow Macaroni or dumpling pasta has a highly versatile shape that can be topped with any sauce, baked, or put in soups, salads and stir-fry dishes. Manicotti: Manicotti or small muffs is a mixture of meat, cheese and vegetables, topped with sauce and then baked. It can also be stuffed and frozen for later use. Rotini: Rotini or twisted/spiral-shaped pasta goes well with meat, vegetables and cheese. It can be used to create fun salads and baked casseroles. Wide Egg Noodles: It is a wide long strand of pasta made from eggs. It goes well with soups, salads, and casseroles. It can also be served hot with any sauce. Spaghetti: Spaghetti appears like a long length of cord. It is one of the American's favorite pasta shape and is the perfect choice for any sauce. It is used to prepare casseroles and stir-fry dishes. Pastas are incorporated into a number of local cuisines and have different ways of preparation from those in Italy. In Hong Kong, the people have adopted spaghetti and macaroni as basic ingredients in the Hong Kong-style Western cuisine. In India, macaroni is been cooked in a traditional way with jeera, turmeric, finely chopped green chillies, onions & cabbage.